Each time he walked through a hospital entrance, Luca Sbisa wondered what he would say or could say to the families and survivors of the mass shooting that took place on October 1 in Las Vegas. When he left, it wasn’t his words, but those of others that left a lasting impression. In the aftermath of the shooting at the Route 91 Harvest festival, where 59 people were killed and hundreds more injured, players from the NHL expansion Vegas Golden Knights talked about ways they could reach out to those affected by the tragedy. Visiting local area hospitals was at the top of the list. As it turned out, Sbisa didn’t need to agonize over any conversations he had. 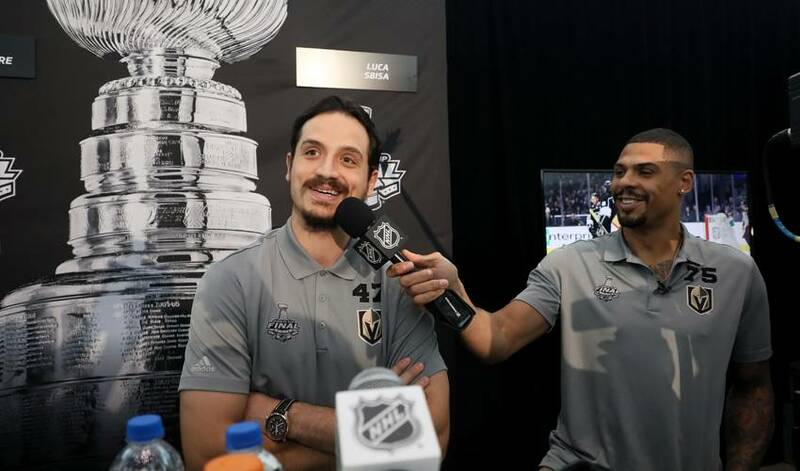 Prior to puck drop on their home opener on October 10, Las Vegas resident, defenceman Deryk Engelland, delivered an emotional speech to the crowd of 18,191. The Knights then went on to win the game against Arizona by a score of 5-2. The Golden Knights would win nine of their first 10 games in Las Vegas, setting the tone for a Cinderella season. After sweeping Los Angeles and eliminating San Jose in the first and second round, respectively, of the Stanley Cup Playoffs, Vegas ousted Winnipeg in the Western Conference Final to advance to the championship round. Although Vegas would ultimately fall in five games to the Washington Capitals, the relationship between the players and fans remains as strong as ever. For the 28-year-old Sbisa, who dealt with four major injuries and was limited to only 30 regular-season games, the 2017-18 season was unlike anything he had ever experienced in his hockey career. “When you go into something with an open mind, you never know what can happen,” said the Italian-born, Swiss-raised defenceman. “I came to Vegas not knowing what to expect and ended up playing in the Stanley Cup Final. My family and I really enjoyed living in Las Vegas. It’s probably one of the favourite places we’ve ever been. It’s an unbelievable place with great people. It was a fun year. Sbisa doesn’t expect that unity to ever wane. When both your shoes get stuck on top of a light fixture, it’s nice to have your teammates nearby to help save the day.